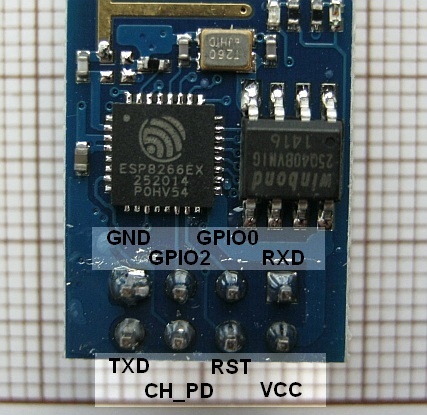 ESP8266 WiFi SoC has gained enormous popularity in the nick of time. Right after hackaday introduction dedicated community forum was created despite that first batch of modules was still in shipping so virtually no one had it in hands. The key to success was its price - $5 or even less, including shipping fee. That's significantly cheaper than e.g. CC3000 module from Texas Instruments ($13.80 @ 1000 pcs for basic module that requires pretty much BGA soldering or $35 for more friendly breakout board). 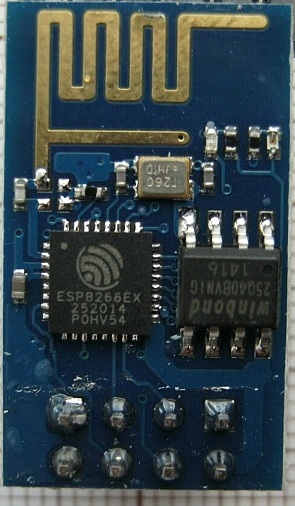 ESP-01 is the most common variant, with PCB antenna and 2x4 100mils header. 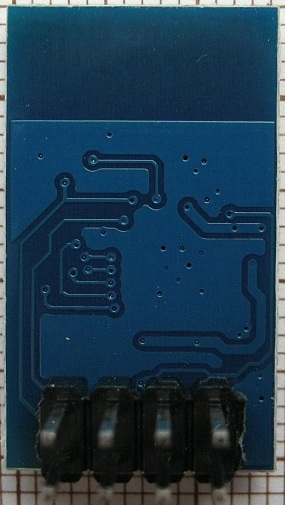 PCB size is 14.2 x 24.5 mm. Funny observation: so far (October 2014) on all pictures I was able to read timestamp chip is dated to 25th week of 2014. Exception is espressif.com (manufacturer) website where chip from 15th week is pictured. I could speculate that chip made it to the market very quickly and this is the reason for perfunctory documentation. TXD, RXD: UART, according to Teo Swee Ann reply in July 2016 they are 5V-tolerant, although prior to this it was not officially stated. Connect RXD to TXD of uC/UART converter and vice versa. Note: there is also very similar in shape/size and component location module that has only power and UART connected (otherwise known as Wi07C V080) - you should probably avoid it. Second (and more visible since it may be difficult to see traces on the photo) difference is lack of status LEDs. Module I've bought contains W25Q40BV Winbond serial Flash memory in SOIC8 package. It has 4Mbit capacity, so it matches exactly size of available firmware files (512kB with bin format, around half of file is filled with 0xFF, ~128kB when packed with zip). As shown by custom electrodragon.com firmware it actually consist of two images: "flash.bin" loaded at address 0 and "rom.bin" at address 0x40000. Out of the box version I've received was 00160901 - older than first version that can be updated online (so called "cloud update"). Using XTCOM_UTIL (API Test / Flash image download) I've updated it directly with "v0.9.2.2 AT Firmware.bin". For this version UART speed has to be set to 9600bps, but than it can be changed with AT command and it stays at set after power down cycle. For a quick TCP client test I've grabbed my very old TCP server/terminal written with C++ Builder 6: BcbServer.zip. It listens on TCP 7778 port and displays received text. Source code of my web thermometer based on ATmega32 (that's overkill, but I had unused board from previous version of this thermometer with ISA eth card; ATmega8 would be sufficient after disabling few log lines, FLASH usage is just little over 8kB), ESP8266, SHT11 and MPXA6115A: thermometer.zip. Scheme: ATmega32_ESP01.pdf. Note: not verified thoroughly (drawn after assembling device). 2014.11.08: Thermometer_20141108.zip. Changed SoC mode from AP+STA (AT+CWMODE=3, access point + station) to STA only (AT+CWMODE=1). While mode 3 may seem most universal it creates possible security issues - enabling it creates by default open network (SSID: ESP_MACBYTES) with no encryption and authorization. With today's high number of WiFi-enabled devices running open network may also limit reliability and cause current consumption increase - it would be more sensible to not enabling access point mode until AT+CWSAP command with explicit encryption mode, channel, etc. is issued. Note: for obvious reasons WiFi network SSID password and few other parameters (HTTP server IP/host, php script file name) have to be filled up in config.h and also output binary file is not included in archive.